Ter Leepe is a 1 Michelin star restaurant and banquet in Zedelgem (near Bruges) in the West Flanders region in Belgium. Upon arrival guests would not suspect that the building hosts one of the best restaurants in Belgium, but after entering the restaurant’s door you will feel that magic is happening here. The restaurant itself is established in a renovated villa and behind the restaurant there is a big banquet for parties and weddings. The restaurant’s interior is luxurious, rather traditional, cozy and very beautiful. Light, brown colors are combined with dark and comfy sofas, modern art, soft lighting and traditionally set tables. There is a corner where guests can start with their aperitif and end with after-dinner drinks, and several dining compartments where lunch or dinner takes place. 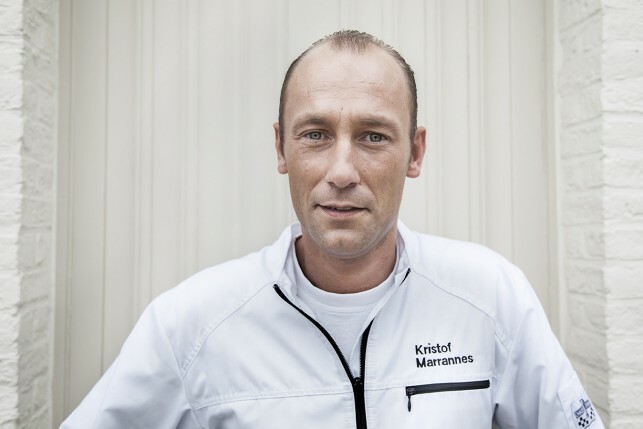 Chef and owner Kristof Marrannes was raised in Ter Leepe, the previous restaurant from his parents, and took over the restaurant in 2005. Kristof also gained experience in dining temples like Sea Grill in Brussels and Hof van Cleve in Kruishoutem. He directly brought renewal to the restaurant and quickly received national and international recognition for his talent. The chef got in the spotlight with an inventive, laborious, but balanced cuisine which incorporates lots of new technologies. The restaurant has a small team of only nine people but together they produce an exceptional output. In the kitchen, Kristof Marranes is assisted by his sous-chefs Gregory Slembrouck and Ruben de Man and as a team they create amazing dishes and strive for the perfect taste. Wines are presented by the charming Cathy Verbeeke, who is still young but displays great knowledge of wines and presents interesting and great pairing wines with the menus. Another remarkable figure in restaurant Ter Leepe is Loes Govaert, who manages the service and the dining rooms. Loes is also young but serves guest in a mature and highly professional style. It is truly exceptional and a pleasure to see such a young, dynamic but very skilled and professional team at work. Kristof chooses for dishes with an intriguing mix of flavors, contrasts and textures. He wants to elevate his dishes to works of art and only uses the best and freshest products and ingredients, which are converted to very creative and smart dishes. The chef transmits stories through his dishes and they impress young and old diners with delicious flavors, an impressive presentation and endless creativity. 1) ‘Expressions of the Sea’ – served as a ‘Fruits de mer’ interpretation: Razors with avocado, seaweed and oyster vinaigrette; Zeeland oyster with cucumber varieties; and Edible crab and razor, algae cake and salty vegetables. A beautiful and very complex dish that is perfectly balanced in flavors, acidity and greasiness! 2) Three different interpretations of scallop: Scallop marinated with fennel, orange, sour cream, carrot & yuzu vinaigrette; Scallop cooked on hot stone with black pudding crumble; and Scallop in shell, with Jerusalem artichoke, smoked eggplant and leeks. 3) Langoustine with a crust of porcini mushrooms, smoked eel, cabbage varieties, hand-peeled shrimp, quail, mousseline of bergamot, flan shrimp, and shrimp gravy. We were really surprised by Restaurant Ter Leepe and enjoyed an amazing lunch with beautiful dishes. The staff does everything to make their guests leave with a big smile and a satisfied feeling, and everything is managed to perfection with a keen eye for the smallest details. Recommended!